Aaron Kwok’s latest film, “After This Our Exile (父 子)” will be released on 30th November 2006. 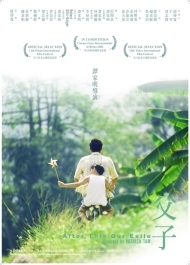 Directed by Patrick Tam, the movie focuses on the awkward and complicated relationship between father and son after the mother abandons the family. Aaron Kwok plays a father and gambling addict for the first time, while Charlie Yeung, plays the estranged wife, who is faced with the difficult decision to create a new life for herself, or to be saddled with a violent man she no longer loves. In the middle of this, there is the innocent son, who witnesses his family’s disintegration and is forced into a vagabond life with his father. Later, the son was caught and sent to a juvenile detention center. Father visits him and son bites off his ear. Ten years later, son returns to his home town and sees somebody who looks like father – they do not meet. Father and son walks away in different directions. The movie is shot in the steamy, tropical locale of Malaysia. The movie is nominated for 7 Golden Horse Awards for Chinese-language cinema including Best Feature Film, Best Actor (Aaron Kwok), Best Cinematography (Mark Lee) and Best Original Screenplay (Patrick Tam and Tian Koi Leong). Patrick Tam is a famous director with the Hong Kong New Wave cinema of the 80s and also widely known as Wong Kar Wai’s teacher, and as the editor of the infamous scene with Tony Leung Chiu-Wai at the end of Wong’s Days of Being Wild. He made his feature film debut in 1980 with The Sword, followed by the acclaimed titles Nomad (1982), Final Victory (1987) and My Heart is That Eternal Rose (1989). Nearly 17 years later, to everyone’s great surprise, he announced his latest movie, After This Our Exile. Check out the movie at http://www.afterthisourexile.com/. This entry was posted on Sunday, November 19th, 2006 at 4:09 pm	and is filed under Movie Trailer. You can leave a response, or trackback from your own site.